Although Brazil has taken criticism for World Cup infrastructure investments, examples like Belo Horizonte’s MOVE bus rapid transit (BRT) system show how a project can serve visitors and also provide lasting impacts for the people of Brazil. Photo by Mariana Gil/EMBARQ Brazil. One such transport solution is new bus rapid transit (BRT) systems, which are moving fans to directly or to other modes of transportation to access the stadiums like Maracanã (Rio) and Mineirão (Belo Horizonte). 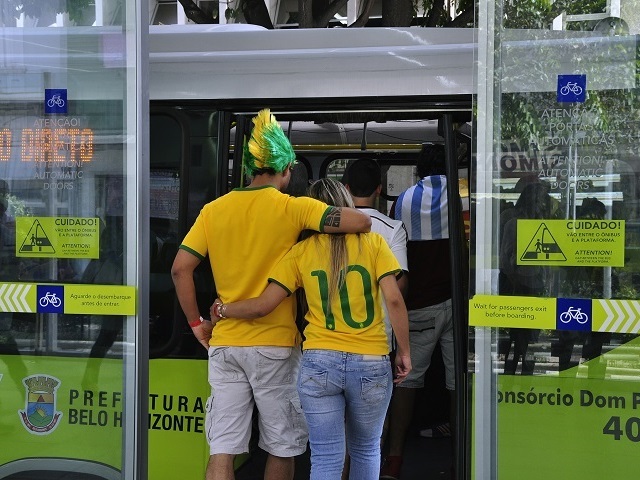 For example, in Belo Horizonte, getting to the World Cup via BRT takes approximately 20 minutes, whereas getting to a game via car takes approximately 1 hour and 30 minutes. World Cup-related investments helped finance BRTs projects like in Rio de Janeiro, Belo Horizonte, and Recife, three of Brazil’s biggest cities. These systems are expected to improve quality-of-life for Brazilians long after the World Cup concludes—and could help inspire greater uptake of sustainable transport options throughout the country. In Rio, for example, two BRT corridors are already up-and-running, and more two are forthcoming to the 2016 Olympic Games, encircling the entire city and moving 1.6 million passengers per day through approximately 160 km of BRT. The TransCarioca corridor, recently launched before the World Cup, is expected to serve about 450,000 residents daily. It was also created to move visitors quickly to and from the international airport. Rio’s TransOeste BRT corridor— which connects the Barra da Tijuca and Santa Cruz districts —is already benefiting more than 135,000 riders daily, cutting their commuting times in half. And both corridors provide affordable transport to some neighborhoods that never had it before and allow residents better access to services and facilities. Residents of Belo Horizonte are seeing similar improvements, thanks to their new BRT system, MOVE, which was developed with support from EMBARQ Brazil. Launched four months ago, MOVE already proved its benefits moving people three times faster than commuting by car during rush hour. When fully operational, the system will transport more than 700,000 passengers each day. The new high quality system is also improving surrounding areas of its corridors and is helping to reshape the downgraded downtown area to a more people oriented environment. 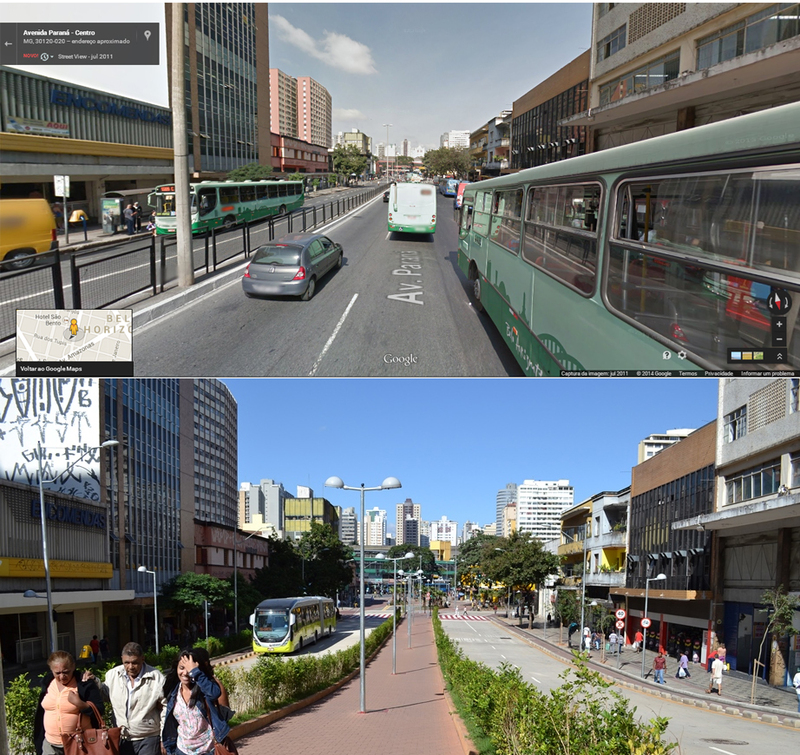 Belo Horizonte’s MOVE bus-rapid transit (BRT) system dramatically altered Paraná Street from a congested road to became a place for people-centered mobility. Before Photo Google Street View. After Photo Luisa Zottis/EMBARQ Brazil. The encouraging news is that Brazil’s movement towards sustainable mobility will stretch beyond the confines of a few cities and the World Cup. The country is currently moving forward on its National Policy on Urban Mobility. The policy, established in 2012, requires that all cities with more than 20,000 inhabitants and those with significant tourism and trade industries create an urban mobility plan by April 2015 if they wish to secure national funding for transport. The plans must prioritize non-motorized transport—such as cycling and walking —as well as public transit systems.